Belgium's Frèdèric Caudron won the three cushion World Cup event in Sluiskil, Netherlands. In the final he outgunned Nikos Polychronopoulos (Greece) 3-0 (15-5, 15-3, 15-9). Tying for third were defending champion Torbjörn Blomdahl (Sweden) and Kyung-Roul Kim from South Korea. They both lost 3-2 in their semi-final matches. Caudron dominated this tournament stats wise. He had the highest general average of 1.963 and the highest single match average of 3.105. Belgian Barry Van Beers' 15 was the highest run of the event. Clearly Caudron has kept his form during the off-season. Last year Caudron won two World Cup events plus the Sang Lee International. The win puts Caudron atop the initital World Cup Ranking, followed by Polychronopoulos, Blomdahl and Kim. Caudron also takes the lead in the World Players Ranking. Runner-up Polychronopoulos stays in ninth. Blomdahl drops from first to second and Sánchez stays in second. The event took place 21-27 January 2008, in the Congrescentrum 't Meulengat, Sluiskil, Netherlands. It was the first of five events in the 2008 World Cup. Next event is in Porto, Portugal, 30 June - 6 July. 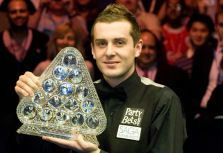 England's Mark Selby won the Saga Masters on his first appearance. In the final Selby defeated countryman Stephen Lee 10-3 to capture his first major title. Ken Doherty (Ireland) and Marco Fu (Hong Kong) lost out in the semi-finals. Defending champion Ronnie O'Sullivan (England) was beaten 6-5 by Scotsman Stephen Maguire in the first round. Selby earned £150,000 for the victory. In addition he won £5,000 for making a 141 in the last frame of the final. He shared the high break prize with Doherty. Lee won £68,000 as runner-up. It must have been a welcome return to form for the man who's ben struggling with his game lately. The event took place at the Wembley Arena, London, England Jan 13-20, 2008. Next up on the snooker calendar is another non-ranking event, Malta Cup which starts 4th February. Francisco Bustamante from the Philippines is the Master of the Table in the Derby City Classic. The tournament is comprised of three events. Bustamante was seventh in bank pool, third in one pocket and second in 9-ball. This was Bustamante's first all-around-title. It was Souquet's third 9-ball win after also lifting the trophy in 2004 and 2006. During the week there were several more events being staged. For instance, Darren Appleton (England) beat Niels Feijen (Netherlands) in the final of the Straight Pool Challenge. The tournament ran from January 4-12 at the Executive West Hotel, Louisville, Kentucky, USA. Approximately 400 players took part in each of the three main events.